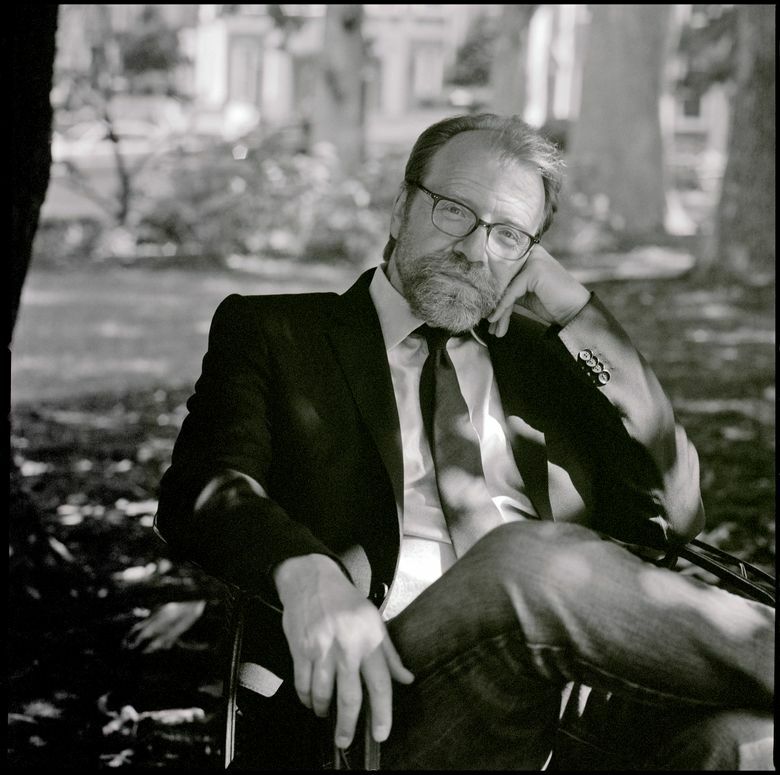 An interview with author George Saunders, whose highly anticipated first novel, “Lincoln in the Bardo,” is a heartbreaking tale centering on President Lincoln’s grief over the loss of his 11-year-old son Willie. George Saunders’ innovative first novel, “Lincoln in the Bardo,” has at its center an image from history. In 1862, Abraham Lincoln’s beloved 11-year-old son Willie died after a brief illness. The bereft father, struggling to emerge from grief, was said to have on several occasions left the White House alone at night to enter his son’s crypt and hold his boy once more. “Lincoln in the Bardo” is not told as a conventional novel would be; instead, it’s a chorus of voices from another world. The bardo (a Tibetan concept of an intermediate state; in this case, between death and the hereafter) is full of ghosts that greet young Willie on his arrival. They watch, as one from the living — a tall, grieving gentleman, who “might have been, at that moment, a sculpture on the theme of Loss” — sits among them. And they tell their stories, many of them; interweaving together in a noisy, messy symphony. It’s a technique that owes something to the play that “Lincoln in the Bardo” almost was, and to other influences too: chat lines — “I love the way those look on the page, rambling misspelled texts and the answer showing up three pages later” — and to the stream-of-consciousness modernism of Faulkner and Joyce. Of the 166 different voices in the book (he knows the exact number; “I made a spreadsheet”), not all are fictional. “I thought, to do ghosts all the time was not going to work,” Saunders remembered. “It’s almost like there’s too much control in the writer’s hand, since the ghosts can do anything.” The idea came to him: why not add voices from nonfiction accounts of the period? The result gives texture to the book, filling in details of Lincoln’s appearance (which are, fascinatingly, contradictory — “what memory does with time is so beautiful,” Saunders said), his demeanor, and the party given at the White House on the night Willie died, with his worried parents slipping upstairs to check on him. Every one of those voices gets his or her due on the upcoming audiobook, for which 166 different readers were recorded. Among them: Julianne Moore, Nick Offerman, Megan Mullally, David Sedaris, Ben Stiller, Don Cheadle, Carrie Brownstein, Keegan-Michael Key, and Saunders himself, who’ll voice the elderly Rev. Everly Thomas. Immersion into 19th-century language was something new for Saunders, whose short stories generally take place in a slightly futuristic present. “I think so much of art is stumbling into a situation where a constraint is thrust upon you, and then cheerfully accepting the constraint,” he said. “In this case, I wanted to write about 1862, and that means I can’t use contemporary diction, which is my best tool.” Because his strongest gifts were not allowed to the table, he said, it launched a process of “developing compensatory gifts.” “Now I’m having to relearn to speak contemporary English!” he said, with a laugh. Though he plans to return to writing short stories (“this was a vow I made to myself: write stories the rest of your life”), Saunders said he enjoyed the process of spending several years on one work.